Mobile units can be phased in seamlessly to ensure patients have unbroken access to services in locations which are convenient for them. Vanguard Healthcare works with Estate teams and Capital Planners to solve the challenges associated with short-term refurbishment and/or build projects. Vanguard provides an innovative approach to delivering healthcare solutions to NHS Trusts across the UK and Ireland. Their mobile healthcare facilities enable clinicians to carry on providing services in cutting edge and highly advanced surroundings, while their own theatres are temporarily out of commission. This means patient services and waiting times can be maintained during periods of refurbishment, avoiding downtime and ensuring continued revenue generation during the project. 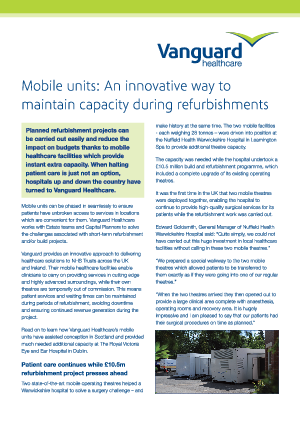 This case study explains how Vanguard Healthcare's mobile units have assisted conception in Scotland and provided much needed additional capacity at The Royal Victoria Eye and Ear Hospital in Dublin.